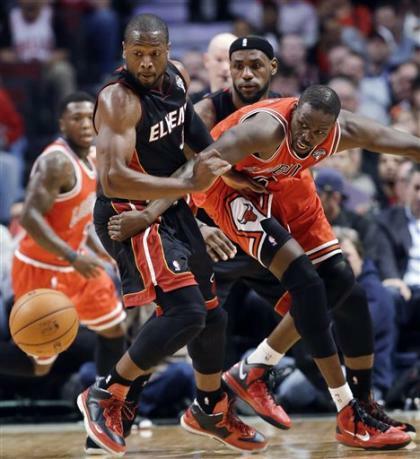 CHICAGO -- LeBron James and the Miami Heat's bid for the NBA's forever winning streak finally ended on Wednesday night. After a magnificent 27-game run of victories by Miami, the Chicago Bulls vanquished the Heat 101-97 at the United Center. The 1971-72 Los Angeles Lakers' record of 33 consecutive victories survives – and may ultimately stand the test of time in this modern NBA. Without 2011 NBA MVP Derrick Rose and All-Star center Joakim Noah, the Bulls' relentless defense and sharp shooting in the fourth quarter managed to stop the Heat six games short of their place in history. The Bulls' lone All-Star on the floor, forward Luol Deng, was brilliant in the victory, closing out the Heat with 28 points, seven rebounds and five assists. In the final minutes, the Bulls played defense in the way they've grown accustomed under coach Tom Thibodeau: contesting every shot, battling strong on the boards and fighting for every loose ball. James was whistled for a flagrant-one foul for lowering his shoulder into Carlos Boozer with a little less than four minutes left in the game, an uncommon expression of frustration out of James in what's been perhaps his best season in the NBA. Nevertheless, James blocked a Kirk Hinrich layup moments later, and soon a Chris Bosh three-point play had the Heat back within 91-85 with 3:32 left in the game. The Heat would come no closer until the final seconds, and the United Center erupted over finally ending Miami's bid for history. James finished with 32 points in the loss. The Heat had not lost since Feb. 1.